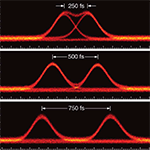 Authors: Apiratikul, P.; Murphy, T. E.
Abstract: We describe an ultrafast optical sampling system that uses nondegenerate two-photon absorption (2PA) in a GaAs photodiode. By choosing the sampling pulses to have a photon energy below the half-bandgap, we successfully suppress the otherwise large photocurrent associated with 2PA of the strong sampling pulses. Using this approach, we demonstrate a background-suppressed measurement of quasi-4-Tb/s eye diagrams, with temporal resolution that is limited by the sampling pulsewidth.